Router manufacturer Cradlepoint has an excellent reputation for building quality hardware focused on the high-end of the market - providing connectivity to everything from Redbox-style kiosks to mobile command centers to enterprise branch offices. Cradlepoint long ago backed away from lower-end offerings that used to be popular with RVers, but Cradlepoint's COR routers with integrated cellular modems have still held some appeal for those with special needs interested in building a bulletproof fully integrated cellular connectivity solution. But there was one fatal flaw that kept all the Cradlepoint cellular-integrated options off our recommended list: the routers were all carrier specific, and swapping from a primary connection on Verizon to your backup on AT&T or T-Mobile was essentially impossible. But over the past month, Cradlepoint has been updating its cellular product line to use a new generation of cellular modems that are faster, more future proof, and they at last support automatic carrier selection too! Cradlepoint's illustration showing the joys of LTE-A. LTE cellular technology was always meant to evolve (LTE stands for "Long Term Evolution" after all), and LTE-Advanced is the friendly name for the next stop on the march towards the 5G future. 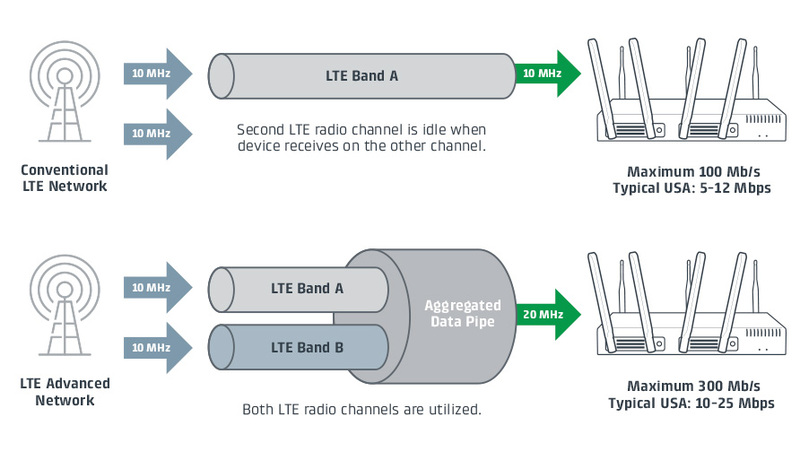 One of the defining features of LTE-A is known as "Carrier Aggregation", a technology that allows for a cellular radio to connect to two LTE bands at once, combing two different signals into a potentially much faster unified data channel. Carrier aggregation also deals with the all too common frustration of having your mobile hotspot picking the slower of two bands if multiple LTE bands are available. If the internal modem in your hotspot can connect on two bands at once, this isn't nearly as much of an issue. Several flagship phones released in the past year (like the iPhone 6S), tablets (only the very latest iPad Pro), and mobile hotspots (like the Verizon AC791L or the AT&T Unite Pro) have supported carrier aggregation - but this technology is still rare. But as cellular networks are upgraded to support LTE-A, you will be smart to look for LTE-A compatibility in your own devices if you want to avoid being left behind. It is great to see that Cradlepoint is now embracing LTE-Advanced modems across almost its entire product line. Cradlepoint's new modem supports every LTE band currently in use by the US carriers. For RVers who consider connectivity critical, having two or three different cellular carriers on board is essential. Cradlepoint's chief rival Pepwave made a fan out of us in early 2015 by replacing its carrier specific cellular routers with universal models that can automatically switch between carriers when you swap SIM cards. But Pepwave has not kept up with adding support for additional LTE bands, or LTE-Advanced. And Cradlepoint now has leapfrogged ahead. The new generation of devices from Cradlepoint support 16 LTE bands, including every band currently in use by all four major US carriers. To change carriers, all you now need to do is swap SIM cards. And since Cradlepoint supports dual-SIM slots, you can even do this virtually by telling the modem to switch between slot A and slot B as needed. The new Cradlepoint modems can also fall back to T-Mobile and AT&T's 4G HSPA+ networks. But the new modems do NOT have support for Verizon or Sprint 3G networks, which is fortunately not much of an issue anymore. 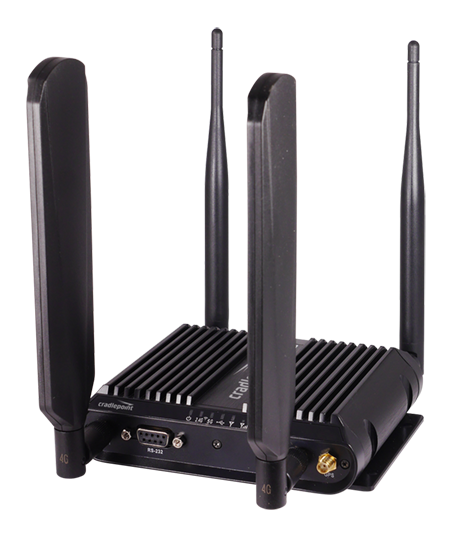 The Cradlepoint COR IBR1100 has been upgraded with a more modern LTE radio. Enterprise-targeted hardware evolves slowly - so Cradlepoint is not bringing any fully new models to market. They are just revising their existing product line to support LTE-A and multi-carrier cellular. Other than the new modem chipset - the new products look identical, have the same core features, and cost the same as the old models. Cradlepoint AER Series - Designed for remote offices, with support for optional dual modems for allowing simultaneous connectivity to multiple carriers. Because the modem module in the AER is removable, existing AER models can be upgraded. Upgraded LTE-A modems cost $449. AER routers start at $799 and go way up, depending on features. These newly update models are just now starting to become available on the market, including at 3G Store and on Amazon. Be aware that with most Cradlepoint hardware, antennas are sold separately. Make sure if you are shopping for Cradlepoint hardware that you get the LTE-A versions, and not the old hardware! Read the specs and make sure! LTE Advanced isn't the end of the line. Upcoming LTE Advanced Pro technologies will have a theoretical download capacity of 1000Mbps. Cradlepoint hardware is an expensive investment - and for most RVers the simplicity and lower cost of a standalone cellular hotspot usually wins out. It is also nice to be able to upgrade cellular hotspots as new technologies (and LTE bands) come out, without waiting for the glacial pace of enterprise-grade upgrades. In the next year or two we'll start to see LTE evolve to allow three bands to be combined via carrier aggregation, and even today's best LTE-A hardware will start to fall behind again. But for some people (you know who you are) - there are advantages to having the router and cellular modem integrated together. And now at last you can get this integration without being stuck on a single carrier, with outdated cellular technology. But there are alternatives to Cradlepoint to consider too. The new MoFi 4500 SIM4 router also supports LTE-Advanced and the same wide collection of LTE bands, for less than half the cost (and with way less than half the polish). And Pepwave has dropped hints on its support forums that LTE-Advanced upgrades are coming to its product line as well in "probably two months or so, maybe less." Whatever you get - the time for LTE-Advanced is upon us. If you are considering a cellular-integrated router - make sure that you seek out LTE-A support! 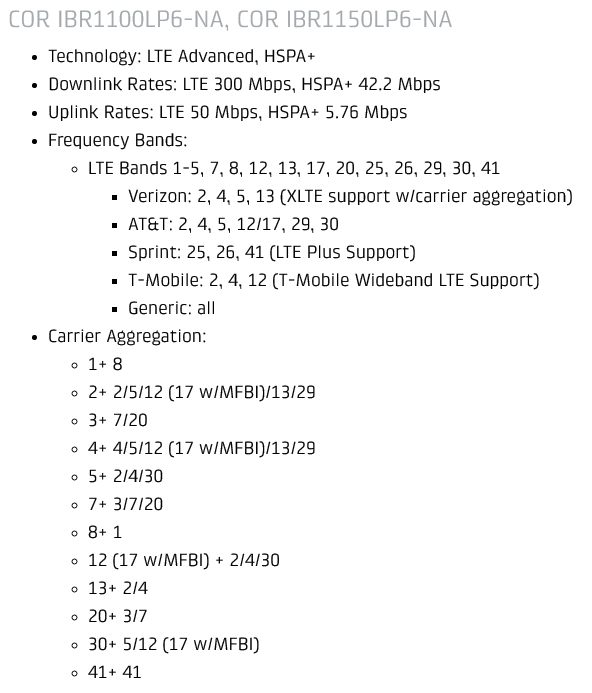 TIP: A lot of LTE devices might give a "3GPP LTE UE Category" in their specifications. LTE Category 6 or better indicates the current generation of LTE-A, and Category 9 is the upcoming generation with support for three combined LTE bands and speeds up to 450Mbps. How to Use Cellular Data To Get Online - Featured guide explaining the advantages of the various ways to get online via cellular - ranging from creating a hotspot with your phone on up to a dedicated cellular router.